Judaism is the oldest of the three Abrahamic religion. There aren’t many others that can take as much pride in their traditions passed down for multiple millennia, or who have undergone so much hardship and survived all of it until this day. It is a religion of strong convictions and bonds to God and one’s family, of remembrance and hope for a world devoid of bloodshed where all differences are resolved peacefully. With a number of sacred texts and such a rich history to fall back to, it’s no wonder that the Jewish tradition is full of symbolic imagery and meaningful ritual objects like the menorah. But, since it is also a very intimate religion, personal affects with a deep spiritual connection are very common and highly valued too. A Judaica gift is sure to be received with joy and gratitude by a person of the faith, and we’ve got quite the selection! The top gifts for men and women on display in our Jewish segment are both fraught with meaning and beautiful to behold! 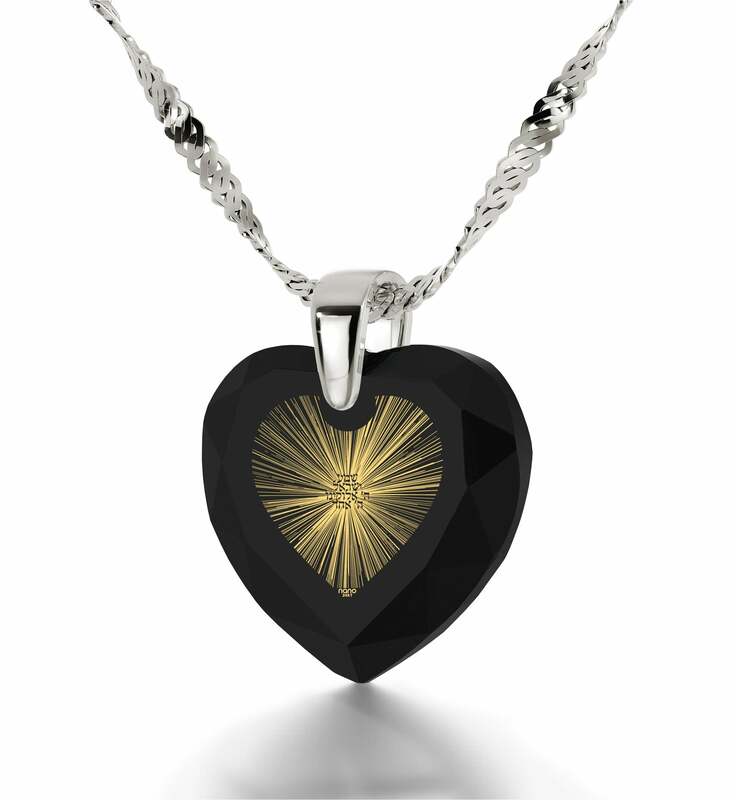 Like our more specialized collections which feature messianic jewelry or prayer for peace gifts,, it is made up of unique gifts for him and her steeped in some of its deepest and most prominent elements. Whether you’re in search of something as ubiquitous as a Jewish star necklace or are on the hunt for something a little more exotic, a brief look will tell you everything you need to know. The Shema Yisrael is an important part of Jewish daily religious life. It is recited during prayers and contains within it the obligations Jews have towards the Lord as well as the promises of bounty he will bless them with for honoring them. The Shema has a strong religious and cultural significance since the beliefs in Judaism are tied so closely with the Jewish people as a whole. In case you were wondering what kind of meaningful Jewish charm to give someone you care about, including the Shema as its prominent detail is a grand idea. 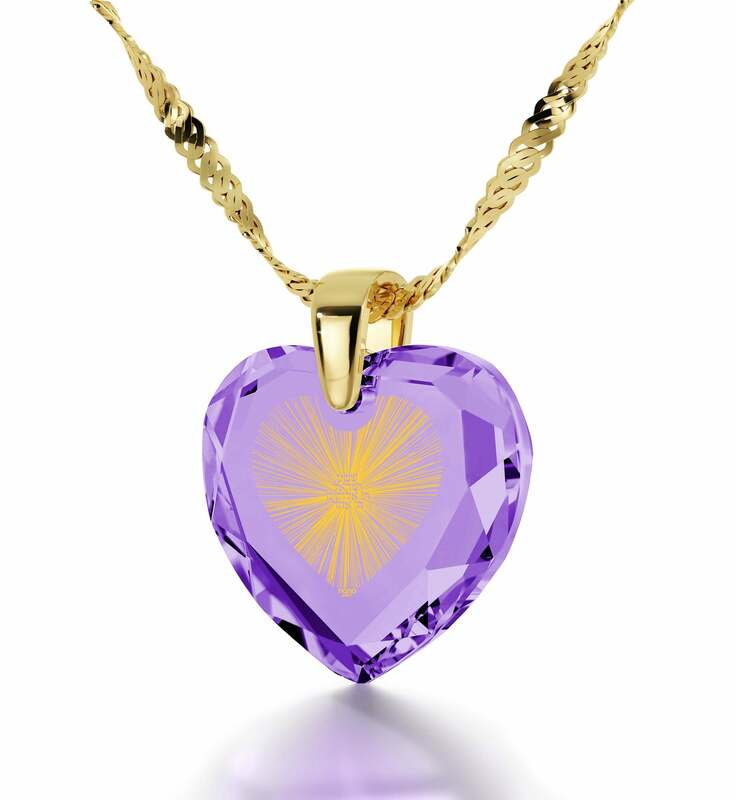 What could be more appropriate for jewelry graced with the Shema than to assume the form of Israel’s national symbol? This Star of David necklace is a cool gift for anyone as its unique shape lends itself well to being worn by men and women alike. The first chapter of the Shema forms a wonderful six-pointed star inside of it, and its tips contain within them God’s name. This next Shema necklace isn’t as striking in its outward appearance as there is no frame and the onyx gem is a smooth oval. It makes up for this with a sterling silver Star of David which holds the stone in place and harbors the beginning of the prayer. The rest of it is written beneath the star in the Hebrew alphabet. Even though they are petite, each letter’s golden likeness is made with a remarkable level of detail. 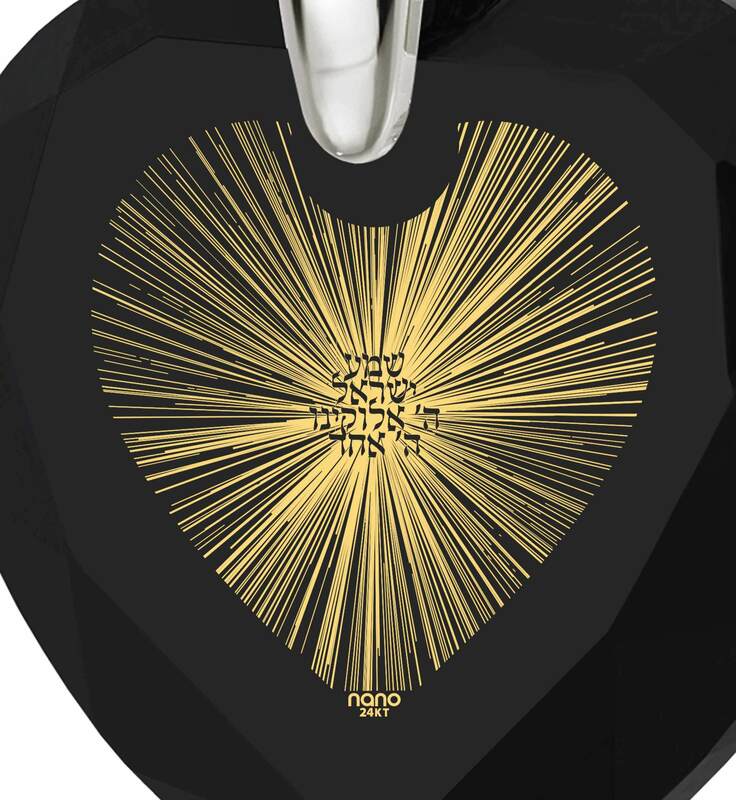 A gold plated version of the religious pendant is an interesting alternative as its star blends in so well with the words to the Shema. Not all of our Star of David pendants have gemstones of onyx. This one cleverly uses the play of light its beautifully cut cubic zirconia gem produces to make the star and the text that accompanies its outline more vivid. Its round frame contributes to the whole ensemble with its own detailed geometric patterns. A personal keepsake that can help one focus during morning and evening prayers, or a chic accessory to round out their style? Why not both! Here’s a piece of Star of David jewelry for women adorned with the recognizable Star of David symbol and the first few words of the Shema Yisrael. Its exquisite golden solitaire setting seats a sparkling Swarovski crystal in a way that lets one experience almost all of its intricate facets. Dainty in the way it presents itself and yet filled with a well of religious meaning, the necklace is an great gift for her whether you’re after a fashionable accessory, or a spiritual token. If you believe that regular gold doesn’t do the prayer justice, a white gold Star of David necklace identical to this one is on offer too. For followers of some of the more mystical Jewish traditions, there’s spiritual jewelry decorated with the ten sefirot of the Jewish Kabballah. Arranged into a stylized tree of life, they represent God’s emanations and are at the core of kabalistic teachings. Inscribed onto our sacred geometry pendants, the knowledge contained within can always be by the side of someone you care for. The cool necklaces for men which bear this design come with three different frames. The first is made up of four prongs that hold up the inscribed stone. The second has a set of miniature decorative screws on it, and a picture frame houses the gem as the last one. No matter which frame you decide on, the resulting Kabballah tree of life necklace is bound to become an intriguing topic of conversation among his friends. 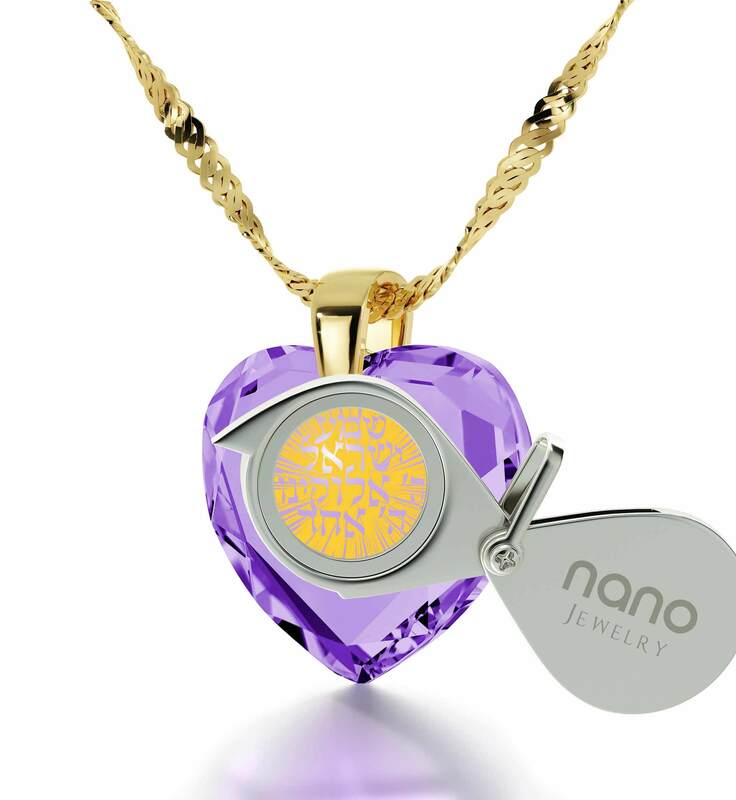 As you’ve probably noticed, the inscriptions on our engraved pendants are quite remarkable. There’s actually more to them than you might think! Apart from depicting the sacred texts and knowledge of the Jewish faith in exquisite detail, they will last for more than a lifetime since the manner in which they’re created makes each both resilient and so minutely detailed that a possibility of imitating it simply doesn’t exist. When we say that they’re one-of-a-kind it isn’t just some marketing ploy – it’s a fascinating trait that makes the Jewish gifts we lovingly provide different from more mundane offerings. You can be sure that the Jewish jewels will go over perfectly as a Bar Mitzvah gift or a present for Hanukah. The magnifying glass they ship with and a decorative box which houses them improve upon this already amazing gift for him or her as the one you’ll gift a necklace to will be able to behold all the intricacies of its inscription whenever they wish and keep the necklace tucked away nicely when it isn’t on display. Let yours be the gift which sparks a resurgence of faith within them and order one without delay!